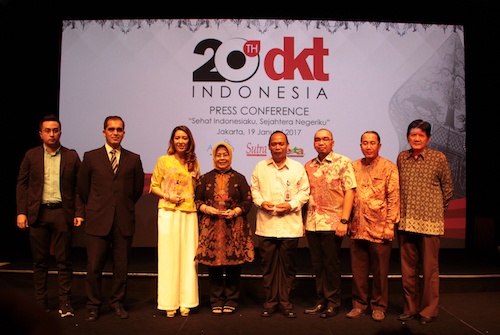 DKT Indonesia, established to increase access to family planning and HIV/AIDS prevention, celebrates its 20-year anniversary as one of the largest Social Marketing programs in the world. By hosting the “SEHAT INDONESIAKU, SEJAHTERA NEGERIKU” (Healthy Indonesia, Prosper State) conference on January 19th, 2017, DKT Indonesia strengthens its commitment to realize the Health and Well-Being indicators set by the United Nation’s Sustainable Development Goals (SDG 2030). “We are proud to be supported by the Ministry of Health, the Indonesia’s National Family Planning Coordinating Board (BKKBN), National AIDS Comission (KPAN), Indonesian Midwives Association (IBI), and other governmental institutions as we work towards our mutual goals set by Family Planning 2020,” says Juan Enrique Garcia, DKT Indonesia Country Director. Since 1996, DKT Indonesia has sold 1.6 billion condoms and in 2016 served nearly 8.3 million couples throughout the Indonesian archipelago, with a cumulative reach of more than 76 million couples (CYP). DKT Indonesia launches its latest digital contraceptive education platform: the tundakehamilan.com website as the guideline of the Family Planning programme in Indonesia to help improving the active Family Planning participants figure; the #UbahHidupLo infographic as an effort to encourage people adopting a healthy lifestyle, and improve the understanding on the dangers of HIV-AIDS; And in the near future DKT Indonesia is planning to develop sexual health training module “Safety Can Be Fun”. “We appreciate DKT Indonesia’s 20-year health and well-being efforts in the area of family planning and HIV-AIDS prevention to achieve Sustainable Development Goals in Indonesia,” says Dr. Eni Gustina, MPH, Director of the Family Health Directorate General of Public Health, Indonesia Ministry of Health. GM Reproductive Health & Contraceptive Business Unit of DKT Indonesia, Aditya A. Putra revealed, “During these 20 years, DKT Indonesia has successfully walked together with millions of Indonesian couples and families to create reliable next generations and quality families by its Andalan Contraceptives. And we managed to contribute 18% to the Family Planning prevalence figure in Indonesia”. 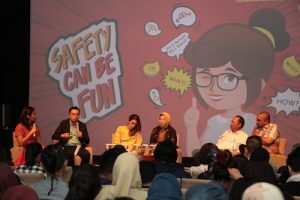 “As the social marketing pioneer in Indonesia, we hope that our new digital and social platforms will continue to help improve awareness and spark behavior change to create a ‘healthy and prosperous Indonesia” adds Juan Enrique Garcia.